From your smartphone to your high-definition television, today’s consumer technology is programmed to do it all. But there’s nothing more aggravating than buying a new digital device that isn’t user-friendly. It’s no different when considering a home security alarm system. The usability of the control panel — the brains of the entire system — is essential. The last thing you want is to feel frustrated every time you use your control panel. To help you make the best choice for your needs, let’s take a look at six popular security system control panels on the market and the features they offer (and don’t offer). The panels fall into three categories: HD touchscreen tablets, units with LCD screens and rubber keypad buttons, and mobile app-controlled devices. 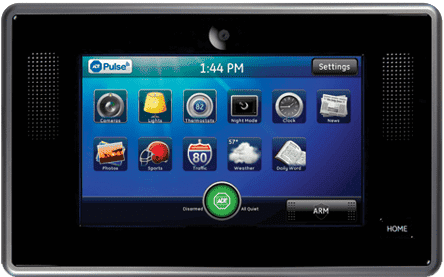 The ADT Pulse interactive touchscreen panel has a seven-inch color HD touchscreen to manage your ADT-monitored home alarm system. It looks like a tablet, so you can use it on the go anywhere in the house. Arms and disarms the system with a single button. Allows you to notify an ADT monitoring station that you need medical, fire, or police assistance. Streams live video from cameras set up in and around the property. Allows you to add or delete users and set a security passcode for users. Controls ADT Pulse lights, thermostats, cameras, and deadbolts connected to the system. Provides security status updates for all entry points in your house. Allows you to check weather, traffic, sports scores, and news updates. Doubles as a digital photo album, displaying photos from your Flickr account. Can be wall-mounted with a separate wall-mount kit. 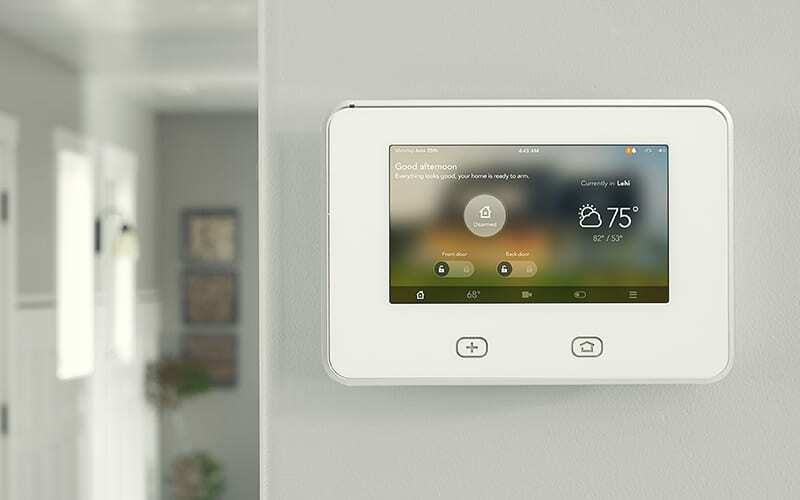 The Vivint SkyControl panel also offers a seven-inch color LCD touchscreen display that serves as an interface for Vivint’s security system features. The panel aggregates data from sensors and homeowner habits to offer tips on how to use the system more effectively. Streams live HD video from installed video cameras around the home and provides recorded video clips via a DVR application. Allows for direct two-way communication with emergency dispatch professionals via built-in microphone and speaker. Operates on an encrypted Wi-Fi network independent of the homeowner’s network. Communicates via cellular technology to ensure the system is always available in the event of Wi-Fi disruptions. Updates the system automatically to ensure the latest features are available. Allows you to add up to 48 user codes. Offers direct control of door locks, window and door sensors, motion detectors, and connected power outlets. Responds to a light finger touch, instead of applied pressure. 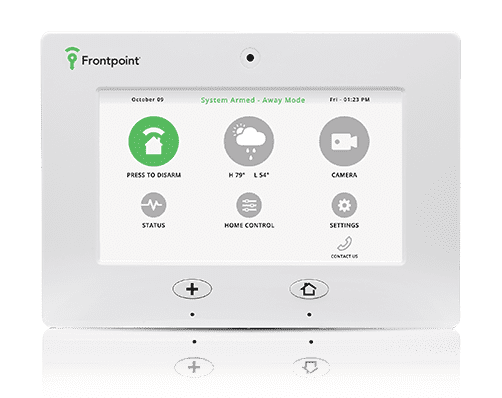 The panel from Frontpoint is similar to the ones offered by ADT and Vivint. 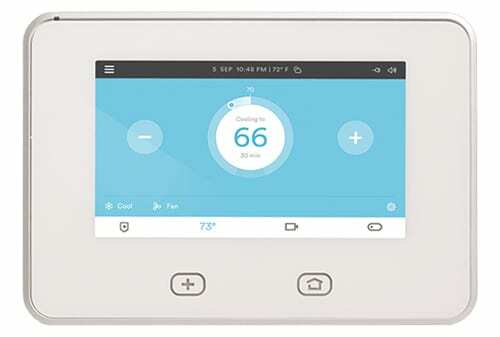 It includes a seven-inch color touchscreen tablet to control the security system and supports a variety of Z-Wave-enabled devices for home automation. Arms and disarms the system with the touch of a button. Comes equipped with a front-facing camera that captures a picture every time the system is disarmed and during every alarm event. Includes a 24-hour battery backup. Offers simultaneous cellular and Wi-Fi connection for redundancy backup and improved speed. Is compatible with Crash and Smash protection, which enables the panel to send alert signals even if it has been damaged. Allows you to program unique user codes. Supports up to 39 individual sensors, including smoke and heat, carbon monoxide, and water and flood sensors. Is Z-Wave compatible to control your home automation devices. Speaks the name of your sensors to give you more intelligent data. Comes with an SD card slot to upload personal pictures. Offers 4-day forecast and daily weather reports. Includes a tabletop stand and wall-mount kit. 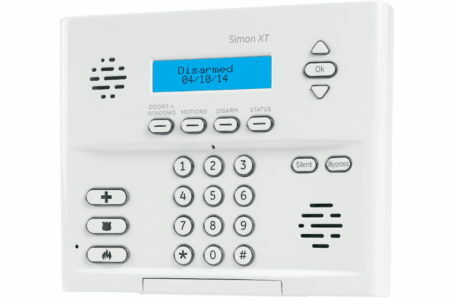 Instead of an HD touchscreen panel, Protect America’s Simon XT offers a simpler interface that features a small text-only LCD screen and rubber keypad. While this setup may seem a bit outdated, its simplicity eliminates any glitches that can occur with touchscreens and minimizes the confusion of a technically more complicated device. Includes dedicated buttons for arming the system when you leave home, arming the system when you intend to stay, and disarming the system. Provides 24-hour emergency panic buttons for contacting the police, fire, or medical services. Includes a built-in 95 decibel siren. Comes with a 24-hour rechargeable battery backup. Allows you to set up nine unique user codes. Includes built-in speaker for audio status messages and door or window chimes. Integrates up to 40 devices. Connects lights, locks, and sensors. Can be mounted to a wall or a table-top stand. Shows the system status on a two-line, backlit, text-only LCD screen. Includes a lifetime equipment warranty and no equipment fees. The panel offered by LifeShield falls somewhere in between the more sophisticated touchscreen panels from ADT and Vivint and the basic LCD version from Protect America. It has a large LCD screen with a rubber keypad and shortcut buttons. Includes a built-in 100-decibel alarm. Offers a one-touch panic button to send an immediate signal to the monitoring center for police, fire, and medical emergencies. Can run off AC power or rechargeable battery, and has a 24-hour backup battery. Communicates with sensors, cameras, and the central monitoring station by broadband, landline, and cellular signals. Integrates with system components such as cameras, door and window sensors, and doorbell. Comes with a stand and can be wall-mounted. The Scout security system is a DIY configuration. Components are offered a la carte, allowing you to choose from any combination of door and window sensors, motion sensors, and HD video cameras, all of which are controlled by the hub. Homeowners manage the hub via mobile app, which allows for 24/7 control — whether you’re down the street or across the country. Uses a mesh network to analyze data from all connected Scout devices, which allows it to tells you exactly what happened, and where. Controls all sensors via Wi-Fi. Includes a 3G cellular backup so it can communicate even when the Internet is down. Offers 24-hour battery backup for when the power is cut. Can control an unlimited amount of sensors in the house. Plugs into your modem or router with Ethernet cable. Allows homeowners to control system by computer, tablet, or smartphone app. There are a lot of factors to consider when choosing a home security alarm system. Having a control panel that is user-friendly and meets your needs and lifestyle is among the most important. If you have a smaller home footprint and live through your smartphone, a Scout Hub might be best. For homeowners who have many entry points to manage and enjoy bells and whistles, the HD touchscreen tablet panels from ADT, Vivint, and Frontpoint would fit the bill. 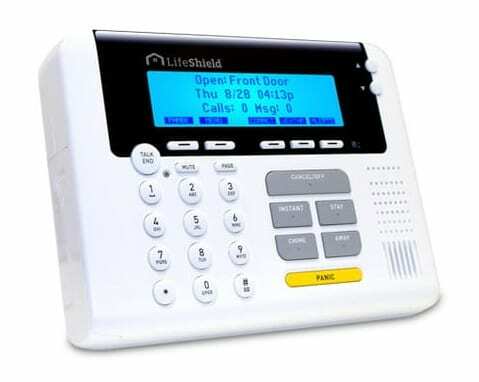 And for those who don’t like or need potentially complicated interfaces, the straightforward LCD screen and rubber keypad panels from LifeShield and Protect America are ideal. Now that you know more about the popular control panels on the market, research home security systems and find the system that’s right for you.